Graffiti in Halo 3: ODST references this campaign. Remember Reach was a Microsoft marketing campaign for Halo: Reach. The campaign was centered around the website, www.rememberreach.com, where users could create a "light monument" of Noble Team composed of thousands of points of light and generated by a real robotic arm. The monument was constructed by special camera equipment which captured and composited the movements and light pulses from the robotic arm, which visitors could see in action on the website. Each user was able to designate a single point of light for the robotic arm, adding their contribution to the light sculpture. The sculpture was completed on September 14, 2010. The campaign featured several live-action shorts by the director Noam Murro, who also directed the Birth of a Spartan teaser. The videos show glimpses of what life was like before the Covenant invasion of Reach. 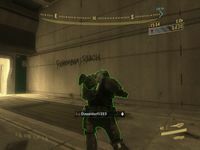 The first video in the campaign, Patrol, was first shown on August 17, 2010 during GamesCom 2010. The promotional site was also launched in the same day, and was opened fully on August 23, 2010. The second film, Deliver Hope, was released on August 26. The Remember Reach Webfilm shows the stories of several families just prior to the disruption of the Visegrad Relay station. It is a compilation of Patrol, Spaceport and New Life. The short, "Patrol", follows three soldiers from Fireteam 3 Charlie as they converse about Noble Team stopping a group of insurrectionists from hijacking a supply truck earlier that day. They are then called to investigate a sudden loss in contact with the Visegrad Relay hub. The short, "Spaceport", follows Gabe and his family as his mother is forced to ship out from Reach. The short, "New Life", follows a man and a woman as they discuss whether to stay in Visegrad or move to Manassas. They then hear the sound of military vehicles rushing past their house as troops are called to the Visegrad Relay. The live-action trailer, "Deliver Hope", follows Noble Team fighting during the Battle of Fumirole prior to the invasion of Reach. Kat-B320 is running through the battle field with a Medium Fusion Destructive Device towards a Covenant CCS-class Battlecruiser. She is hit by an explosion from a Banshee's Fuel Rod Cannon and is crippled. Thom-293 grabs the MFDD and uses his jetpack to fly into the cruiser and throws the MFDD into a Covenant assembly area, however, it goes off early and destroys the cruiser, and presumably, Thom with it. The video, "Creation of the Monument", shows the creation of the Monument to Noble Team from several angles. It also includes thanks to the 118,422 people who contributed a point of light. The tagline is also seen as a graffiti in New Mombasa in Halo 3: ODST. On August 17, 2010, a page with transcripts of the campaign's videos and other material was leaked, but taken down within hours. Ghosts of Reach, a Halo 2 song, plays on the background music of rememberreach.com.